A Sarah Morris painting seems lifted from a familiar drive, where expanses of highway open across hundred of miles, where mountains parade across the skyline, and where the road seems endless—only the sky can cap its winding existence. Like driving such a long, familiar road, Sarah’s paintings inspire comfort, a sense of time and place, and a luminous feeling only Montana can give. 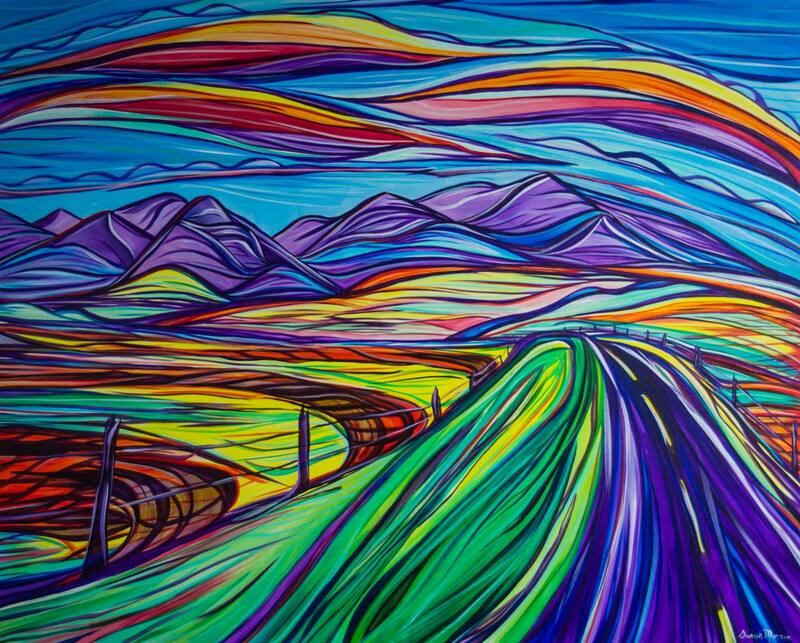 Sarah paints in long expanses and bright, vivid colors with the aide of photos she takes on road trips. These familiar images are rendered new though Sarah’s filter, one of lucid lines and dynamic tones, where she captures some of the most insanely beautify skies cut by curving roads leading into Montana mountains. It’s a familiar scene, one we’ve passed a thousand times, yet perhaps never fully acknowledged. Amongst the sound of highway—the monotonous whirr of the vehicle’s engine lulling us into contemplation—the mountains loom, their presence a form of therapy, a conjuror of solace. Sarah has always felt like an older person in a younger person’s body. She was widowed at age 19, shortly after her daughter was born. From such pain she found art a comfort, something tangible to create from her anguish. Now her mid-20s with a 7-year-old, Sarah embraces her surroundings and the creativity that has evolved our of her circumstances. “So many females don’t realize what a struggle it was 50 years ago (to be a female artist). I feel that I am privileged to be doing this and actually be taken seriously,” Sarah said. Sarah and her daughter’s home, which she purchased on the south side of Billings in her early 20s, provides her a painting studio and a sense of peace, and it grounds her. Like a cook creating a meal from scratch in a home kitchen, Sarah paints in her dining room, often while friends gather in the adjacent living room, plucking guitars and talking amongst themselves. Sarah was 15 when she finished her first painting, which currently hangs in her best friend’s kitchen. “Hopefully she can sell it and retire someday,” Sarah said with a sly grin. A charming 26-year-old and Billings native, Sarah’s charisma stems from her intensely personal nature. She surrounds herself with the things that bring her happiness—friends, music, and art. Her smile is contagious, her curly hair charismatic, and when she paints, all that personality pours onto the canvas. Sarah attended Montana State Univerisy-Billings, originally pursuing an art education degree. Realizing she lacked patience to teach art, but had the passion to create it, Sarah switched to a fine arts major. In MSU-B’s art department, Sarah cultivated an interest in watercolor. In an idealistic world, Sarah figures she could paint pictures that aren’t about selling. But for her, there’s always hunger involved, which makes her paintings all the more urgent. It wasn’t long on O’ahu till Sarah got island fever. “I needed our wide open spaces and our friendly faces,” she said. “I needed to get lost.” She returned to Montana in mid-December, and spent the frigid end of winter in her house painting. This was a new start for Sarah. Feeling so much emotion for Montana, her painting took on a different style. Sarah’s art has evolved since her time in school and her time in Hawaii. “I eventually reached this point of not needing to prove my artist ability, which gave me the freedom to paint things that my emotions wanted me to paint,” she said. Originally published in Noise and Color, January 2013. Photos by Ben Cooper.